I cannot remember the last time I made brownies. Any faint memories I do have aren't good. Once, I made a giant double batch of Barefoot Contessa brownies and left the sugar out. Other times, the recipe has been disappointing--too dry, too wet, too sweet. A few months ago, my friend Abra asked for a good brownie recipe. I'm finally getting around to it, and these deliver. Big time. (Poor Yancey had to endure me preening all night). They take a few pantry staples--lots of butter, flour, plain old cocoa powder and unsweetened chocolate--and turn them into something that will have you sneaking out of bed in the middle of the night. They have a thin layer of crackle on top, fissuring to reveal a dark, chewy density. 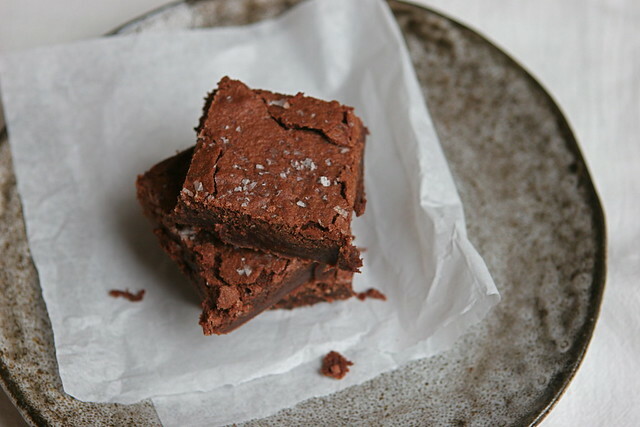 Really, the perfect brownie. I've (again) drastically cut down my sugar and fat intake the last few months. So when I sat down with one of these and a cup of coffee this afternoon, I savored every sweet, fudgy, salty morsel. You won't be surprised that this is adapted from a Melissa Clark recipe. She includes a pinch of cayenne, which I didn't for the sake of children. And I covered half the batch with flaked salt and left the other half plain. I can imagine lots of other additions if you want to experiment--bits of candied ginger, cinnamon for a Mexican chocolate version. I happen to have a 9x13 baking sheet (quarter sheet) which is my workhorse for bar cookies. If you make cookies a lot, I suggest spending the $10 for one. If all you have is a 9x13 baking dish, that will work too. Preheat oven to 350. Line a rimmed 9x13-inch baking sheet with parchment paper. In a microwave or in the top bowl of a double boiler, melt together the buttter and chopped chocolate, stirring until smooth. Meanwhile, combine the flour and kosher salt in a medium bowl. Transfer the chocolate mixture to a large mixing bowl and whisk in the cocoa powder and sugar. Add the eggs and vanilla and whisk until smooth.Fold in the dry ingredients and continue folding until no lumps remain. Scrape the batter into the prepared pan and smooth the top with a spatula. Sprinkle all over with the Maldon salt. Bake for 25-30 minutes, until the edges just begin to pull away from the sides of the pan and the top is set and shiny. Allow the brownies to cool completely in the pan before cutting into 2x2-inch squares.